Just about two years ago, I started leveling Clawswitz to 80 without dying or crafting. You can read his origins tale, or the update. I didn't blog about it, but shortly after coming back to GW2 I finished leveling Clawswitz. I didn't write anything because immediately after Clawswitz hit 80, I felt unsatisfied with the character. Normally, I'd start setting him up with a fashionable outfit. But Clawswitz felt clunky. 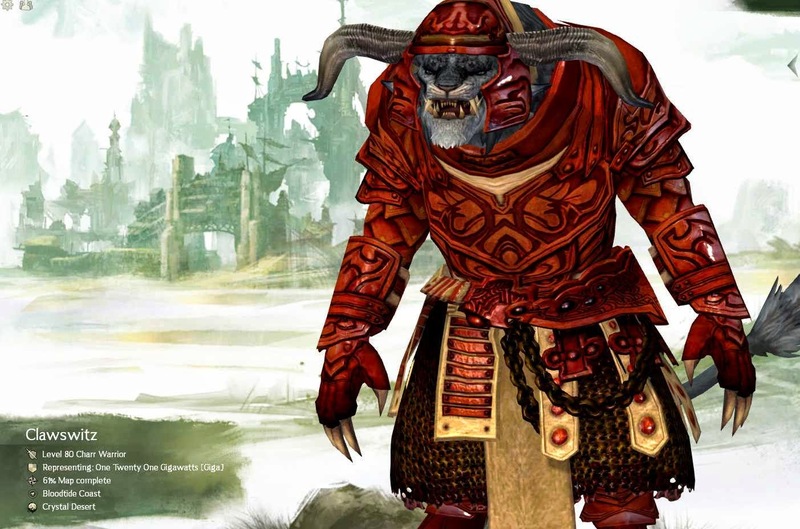 Charr look hideous in virtually every piece of armor; except the cultural gear, which is a bit too spiked for me. Unable to find the right look, I just abandoned him at the end of a jumping puzzle. With the roll-out of megaservers, I decided to level another warrior to 80 without dying. Death is permanent (on death, reroll). While the new challenge greatly restricts access to gear, I decided to allow purchases from karma vendors. This pushes me into a risk-reward situation for getting new pieces of gear, which I enjoy. It also pushes me to unlock more skins for the wardrobe. My first character died while doing Eternal Battlegrounds at 23. I was trying to meet up with a group taking the enemy keep, and ran into two thieves instead. Never had a chance. The second character died at level 2, this time in borderlands. I was outfought by a 80 warrior. Attempt #3 is still alive, now at level 32. I've already had two terrifying near-death experiences on the character, of course. The first was at the spider-themed skill challenge in WvW. I decided to keep fighting with 1/20th of my hp left, and got downed. I couldn't rally off the spider-adds, since they were behind the challenge. Fortunately, I pulled off a vengeance-rally. The second was at the Darkhoof Heights skill point. I was under-leveled, and decided to attack the boss that guards the point. I wasn't paying attention, and barely made it out. For the moment, at least, I'm still alive.